Marine Corps Air Station Camp Pendleton - More Than Just Vertical Lift - USA Patriotism! It is not uncommon these days to see a U.S. Air Force C-17 Globemaster III landing, taking off or loading and unloading cargo at Marine Corps Air Station (MCAS) Camp Pendleton. 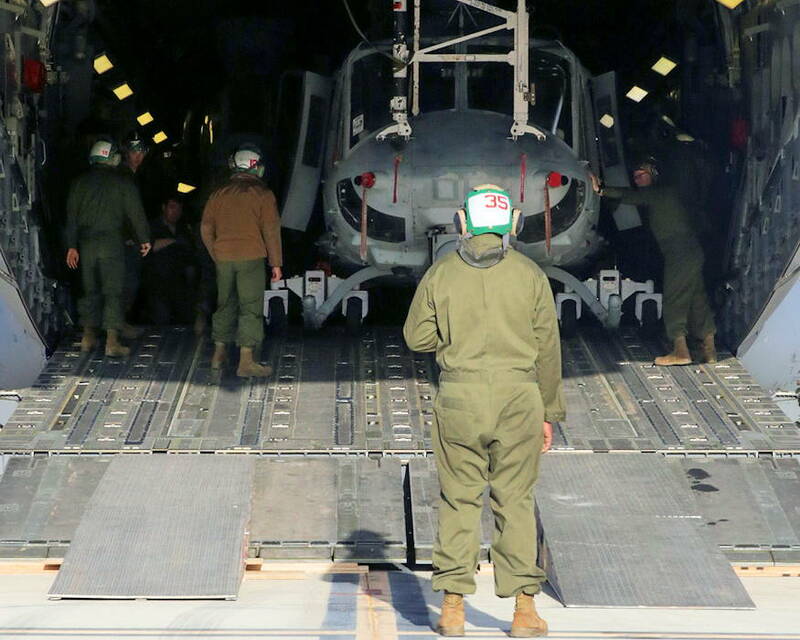 Like what occurred on November 28, 2018 ... when Marines from Marine Light Attack Helicopter Squadron (HMLA) – 469 unloaded from a C-17 two helicopters which had just returned from a unit deployment overseas. What may have been a rare sight in the past is now a routine occurrence and there is high hopes that it can and should happen more. MCAS Camp Pendleton has few limitations when it comes to air lift capabilities. With that being said, the air station can facilitate closer alternatives for planners in regard to special training, gear and vehicle embarking/debarking, and troop transportation. In addition to reducing time on the road transporting personnel and equipment, MCAS Camp Pendleton’s strategic airlift capability provides a secluded and centralized location for movement of cargo to exercises and real world requirements without impacting traffic or telegraphing operations. MCAS Camp Pendleton recognizes that easily available strategic lift can lessen the time required and logistical burden for units to conduct operations. The Air Station is working hard to expand its ability to support strategic lift aircraft, and make sure that unit planners are aware the capability exists right here on base.